Photo taken by Jerry Dobek and Judy Doelker at Rogers Observatory Traverse City, Michigan March 21, 1996 3:30a.m. 3/21/1996 8:30 UT 8" Schmidt camera 10 minute exposure on Hypered 2415 film. The photo shows the coma surrounding the nucleus as well as the streamers of the ion tails. Irregularities in the tail allowed for a computation of the nucleus rotation, 6.6 hours. 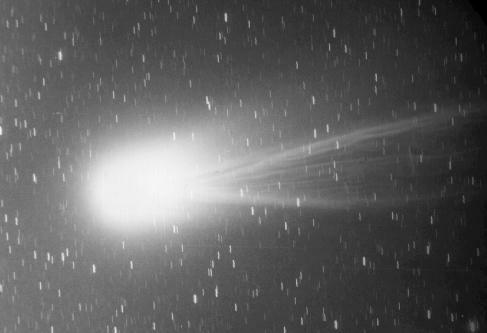 The wavy motion suggests an object that is oblate in shape, similar to Halley's comet. At the time of this photo, the comet had brightened to around 2nd magnitude (similar to the brightness of the stars in the Big Dipper). By March 25th, the comet has reached below 1st magnitude as its position neared the North Celestial Pole. The comet will continue its trek of the northern skies as it approaches the sun. It will pass within 22 million miles of the sun around May 1st. The comet can be viewed heading toward the northwestern skies through mid April.